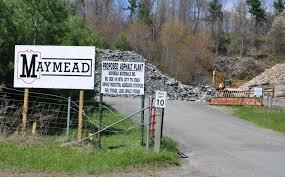 County Commissioner John Welch has requested an agenda item for the commission's regular evening meeting on Tuesday, Feb. 16 (5:30 p.m.): Discussion of the Watauga Board of Adjustment's surprising decision to restore Maymead Asphalt's revoked permit to cook paving material on the Doc & Merle Watson Scenic Highway. Prevailing rumor is that Commission Chair Jimmy Hodges is against an appeal. So, too, probably are Perry Yates and David Blust, both of whom are up for reelection this year. Those three hold the power to appeal to superior court their own Board of Adjustment's unaccountable decision. Reelection. Hope for and fear about. That's the leverage the people have now on the issue of bringing more pollution into this county and plopping it down on a scenic highway and in the middle of residential properties. Inexplicably, the Republican commissioners are reluctant to support the county's legal case - which was solid - and cost the county a great deal of money. The Republican Commissioners also are reluctant to support the county planner, the county's strategy for the 421 gateway - and most significantly, they seem reluctant to protect the hundreds of homeowners in close proximity to the proposed plant - homeowners who will see a reduction in property values when that massive asphalt plant becomes their newest neighbor. The Republican commissioners are paying a lot of money to help the state strip ETJ protections from families who live in the ETJ. Again, not a move designed to showcase support for families who own homes in Watauga.